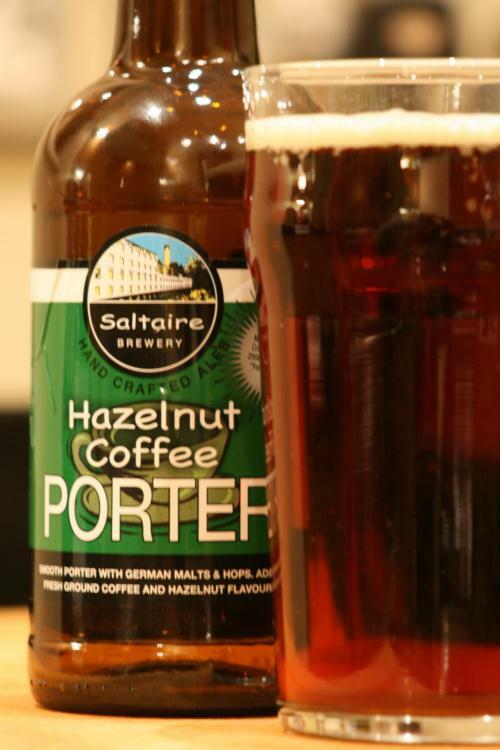 After much effort, I finally managed to get hold of a couple of bottles of Saltaire Brewery’s award-winning Hazelnut Coffee Porter, from the excellent Beer Ritz in Headingley. Beer Ritz is an Aladdin’s cave of premium and real beer and worth a slight detour, even on a snowy day. It may very well be one of the best off licences in the North, stocked with imaginative and diverse lines, staffed by friendly and knowledgeable staff and across the road from Bryan’s, which every Yorkshireman knows is one of our best fish and chip shops. The Hazelnut Coffee Porter is a red beer, not as dark as I’d imagined, with a deep malt flavour and touches of coffee and hazelnut. It’s a very modern, and very successful mix. Saltaire Brewery have recently added the porter to their range of regular bottled beers, owing to some significant awards and increasing popularity. It fares well in the bottle, but I expect that it’s magnificent on tap. One of the best beers I’ve had in recent times.